Recently while hurrying through the Art Institute (Chicago) to see the Vollard Exhibit (fantastic! 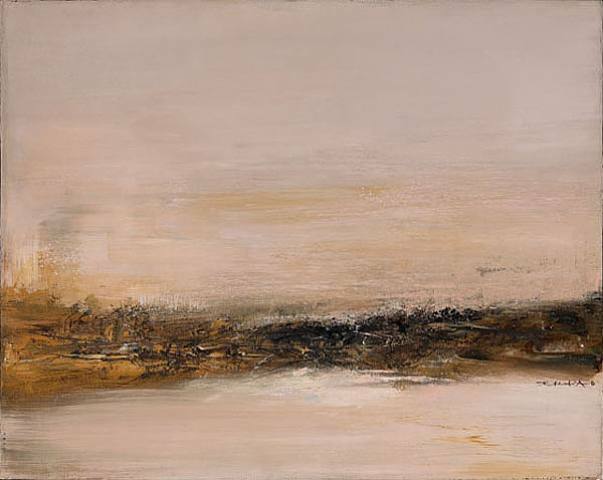 ), my eye was caught by a painting I’d never seen before, by an artist I’d never heard of: Zao Wou-ki. It was a beautiful abstract, on the small side, in a room of really interesting contemporary art. (They’re doing a lot of construction there, so I may never be able to find this room again. . . .) In any case, I was so struck by this painting that I came home and looked the artist up on the net. According to Wikipedia, Wou-ki was born to a wealthy Beijing family of letters in 1921, studied calliagraphy, Chinese brush painiting and Western oil painting at the Ecole des Beaux Arts in Hangzhou, where he was a professor from 1941-1974. He moved to Paris in 1948, and from then until 1974 he painted as an abstractionist. Subsequently, he decided to return to painting in the Chinese style as well. I find fascinating that he paints so beautifully in both styles. I think the Chinese brushstroke painting tradition clearly influences what seems to me to be very landscape-inspired abstracts, but I have no training that would allow me to know if the influence goes both ways. thanks for finding this artist for us, clairan. they are interesting online – such earthy, mysterious, spiritual paintings. so much portrayed in so few brush strokes. they must be awesome to see in person.